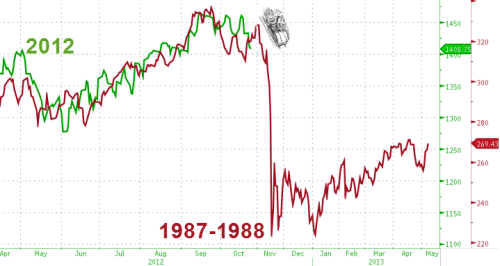 Will the Stock Market Crash Like 1937? 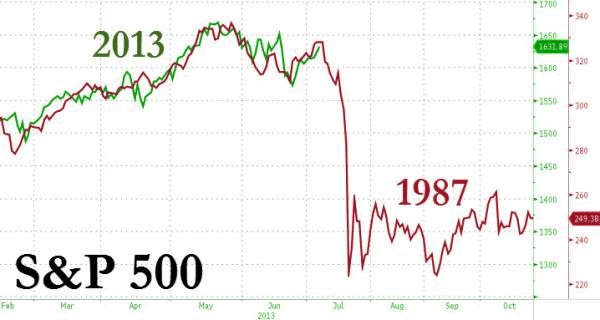 As the stock market rallies, it never ceases to amaze me how popular crash-analogues can be. The 1937 analogue has been quite popular recently, constantly shared and reshared on social media and trading blogs. Consumer discretionary stocks have underperformed defensive stocks recently, which for experienced traders brings back memories of 2000 and 2007. 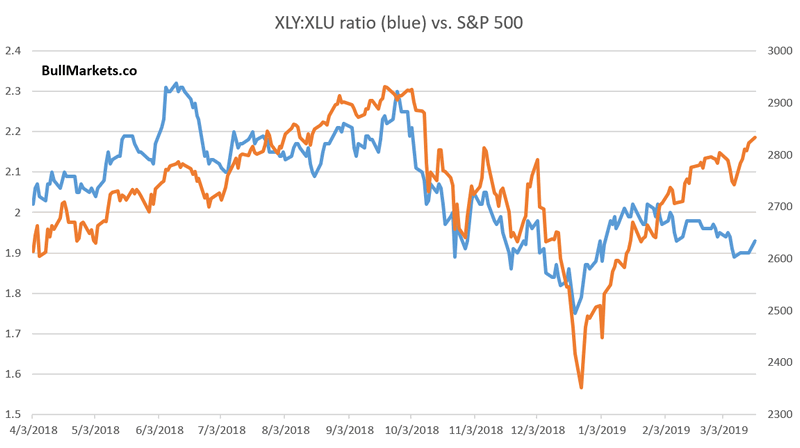 We recently looked at the XLY:XLP ratio. Here’s another way to look at the gap between discretionary and defensives. As you can see, the S&P 500 has “diverged” from the XLY:XLU ratio. Surely this can’t be good for stocks? *I have warned in the past against excess focus on “divergences” and “non-confirmation”. Most of these divergences don’t amount to anything. 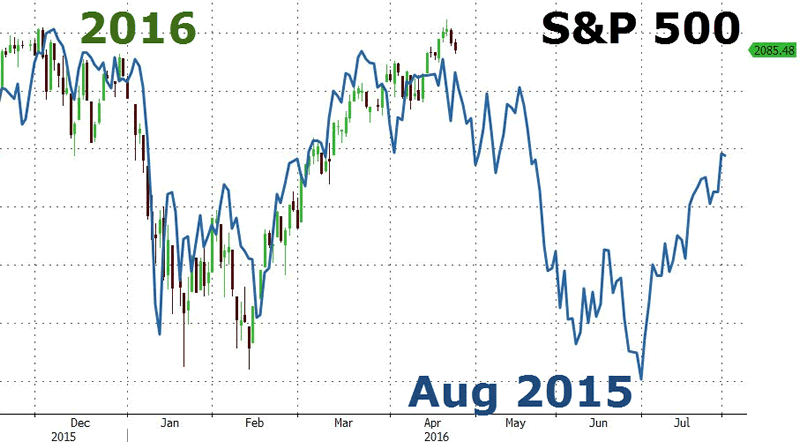 Here’s what happens next to the S&P when XLY:XLU falls over the past 2 months while the S&P rallies more than 9%. As you can see, forward returns are more bearish than random. This mostly happens around bear markets, either at the top or at the bottom. There are also some false bearish signs e.g. in 2016, 2004, 2003. It’s also worth looking at the components in XLY before jumping to any conclusions. 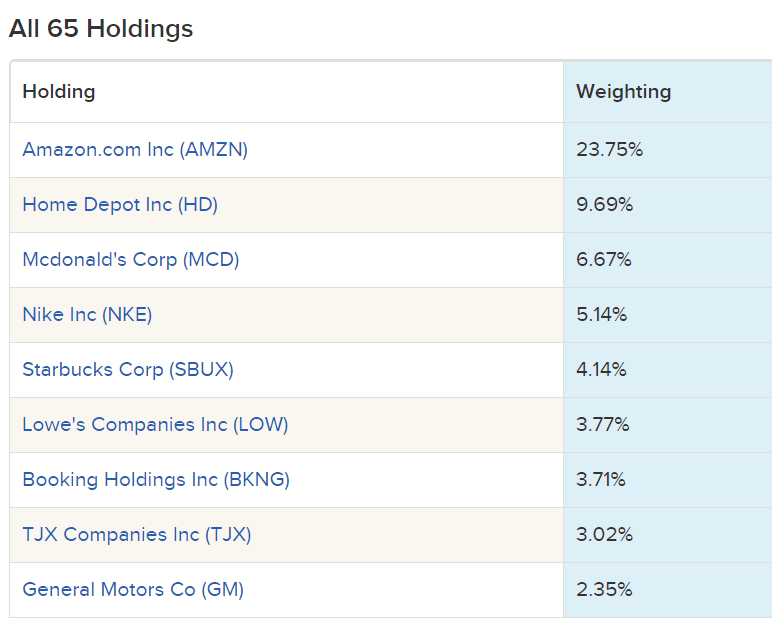 Amazon has performed poorly recently. 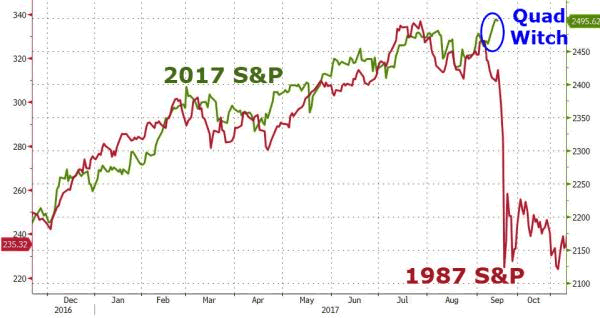 One of the most oft-cited long term bearish arguments is “debt is rising, must be bad for the economy and stock market”. *In reality, nominal debt always rises in the long run. What matters is the ability of borrowers to service their debt. This takes into account rising income vs. rising debt levels vs. interest rates. The following chart looks at the yearly % change in Personal Interest Payments. Notice how it is high right now. Here’s what happens next to the S&P when the yearly % change in Personal Interest Payments exceeds 15% for 4 consecutive months. *The most recent data is for the month of December 2018, but was released in March 2019 due to the government shutdown. Not quite consistently bearish for stocks, but this does happen late-cycle in the economic expansion. Banks’ lending standards could be on the verge of trending up, which is a problem later in 2019. In the past, lending standards trended higher before bear markets and recessions began. A mirror image of Banks’ Lending Standards is the % of banks that have increased their willingness to make consumer installment loans. The latest reading for this figure came close to zero. If this figure reaches zero later in 2019, then long term bulls should watch out. It happens at the start of major bear markets and recessions with the 1996 case being a false alarm. The S&P 500 closed above its upper Bollinger Band today for the first time in almost 6 months (2 standard deviation, 20 daily). Surely this must be bearish? 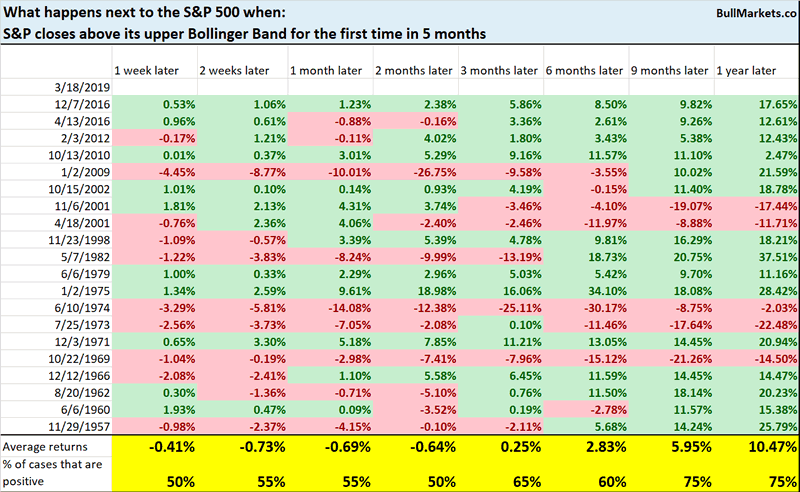 Here’s what happens next to the S&P 500 when it closes above its upper Bollinger Band for the first time in 5 months. As you can see, the stock market’s forward returns are mostly random. Most popular technical indicators are not much better than a coin toss. This has been a very dramatic turnaround, with the S&P falling more than -13% in Q4 2018 and rallying more than 13% in Q1 2019. If the S&P doesn’t fall signficantly throughout the rest of March, then this turnaround will truly be one for the history books. Here’s what happens next to the S&P when it falls more than -13% in one quarter and then rallies 13%+ in the next quarter. 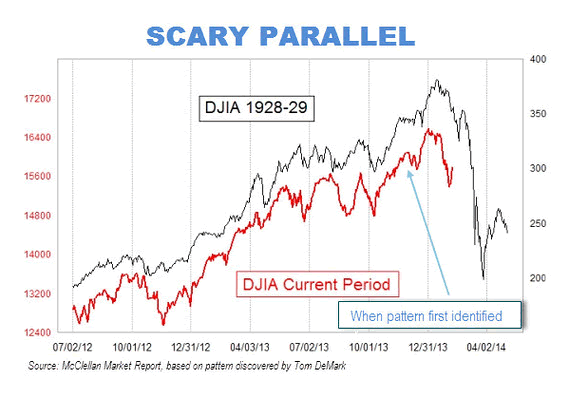 As you can see, such volatility only happened in bear markets and the Great Depression. 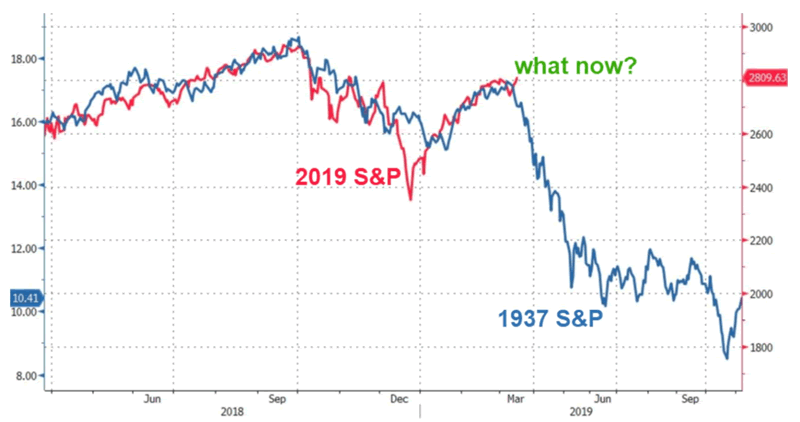 Does this mean that 2019 = the Great Depression all over again? The economy is growing today. Very different macro environment from the historical cases. The S&P 500’s 50 ema crossed above its 200 ema recently. 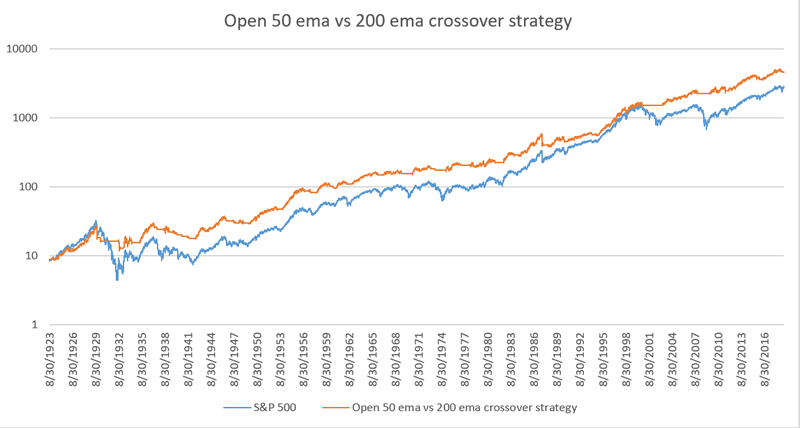 These moving average crossovers are used in popular trend following strategies. When today’s 50 ema (CLOSE $) crosses above today’s 200 ema, BUY the S&P 500 on the next day’s CLOSE. When today’s 50 ema (CLOSE $) crosses below today’s 200 ema, SELL the S&P 500 on the next day’s CLOSE. As you can see, this strategy almost completely matches buy and hold, but with much less downside volatility. What’s going on with this discrepancy? Why is the same moving average crossover strategy yielding 2 different results? Puru’s backtest: when the moving averages crossover today, he buy/sells on the next day’s OPEN. I have attached the data in Excel for those who want to play around with this very simple trend following strategy/model. In reality, these analogues aren’t very useful. When you squeeze, compress, stretch, and change the scales, you can always make the S&P 500 “look like” it’s doing whatever fits your preconceived bias.